Khaled’s son Asahd will be executive producing his upcoming Grateful album. DJ Khaled held a special press conference on Thursday and enlisted Chance the Rapper and Puff Daddy to help with his announcement. According to Mic, Khaled revealed that his upcoming album, the follow-up to 2016's Major Key, would be called Grateful. "The title of my new album coming out this year, my best work ever, on my momma, on my son: Grateful," Khaled said flanked by Puff and Chance. Khaled also confirmed that his son Asahd, who was born in October 2016, will be "executive producing" the album. 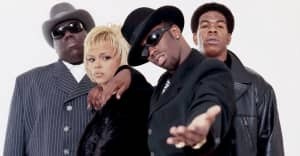 "It's about the evolution of the dream," Puff Daddy added. "At first it was about the 'keys...This [album] is about the longevity." Following the press conference, Puff Daddy led the room in prayer. Khaled didn't mention a release date or detail the features on his album, but he recently shared an Instagram picture of a studio session with Chance the Rapper.